Housing one of the oldest civilisations on the Arabian Peninsula, Oman clings determinedly to its past. However, the friendly people are happy to welcome visitors and extremely proud to show off their culture. Tranquil beaches, magnificent dive sites, dramatic mountains, traditional architecture and so much more await you in this mystical land. Located on the southern tip of the Arabian Peninsula, the Sultanate of Oman borders the UAE on the north west and its coastline is shared between the Gulf of Oman and the Indian Ocean. It’s a country of dramatic landscapes with rugged mountains, deep water fjords, rich green valleys and spectacular desert terrains. 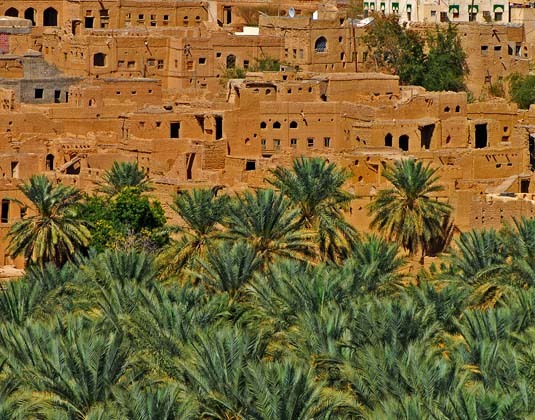 Traditional dhows still sail from port to port and in the interior you’ll find weaving wadis (river valleys) studded with date-palm plantations. Let’s not forget that Oman also has some of the most stunning and secluded beaches the Arabian Peninsula has to offer as well as some truly unforgettable snorkelling and diving spots rich with coral and marine life, including turtles. In the south eastern corner of the country is Salalah, capital of the Dhofar region and once the heart of the nation’s frankincense trade. Facing south over the Arabian Sea, it boasts pristine white beaches to accompany its enviable climate along with beautiful hotels and a stunning natural backdrop of mountains, springs and waterfalls. 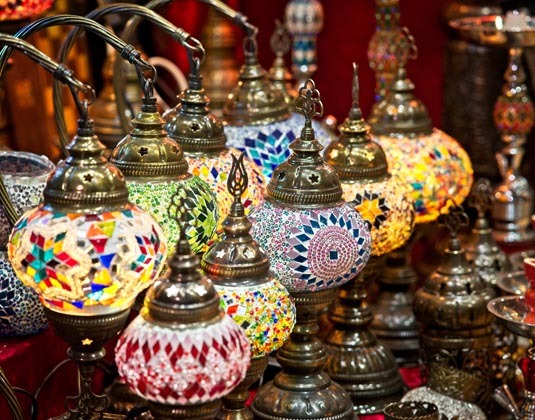 Don’t miss the colourful souks, including the fabulous incense souk, where you can practice haggling for a bargain or two. In the northern Musandam Peninsula, which is isolated from the rest of Oman by the east coast of the United Arab Emirates, is stunning Zighy Bay whose setting is, quite simply, spectacular! Along with the natural beauty of the craggy Hajar Mountains, attractions include the superb diving and snorkelling sites. Away from the beach the capital, Muscat, is a captivating place to visit. Infused with energy and picturesque charm its streets are packed with craft stalls, shops, museums and ancient forts. Of particular note are the 16th century Jalali and Mirani forts which flank the grandiose Al Alam Palace (the official residence of the Sultan). Built in 1972, it has a fairytale facade of towering gold and blue pillars wrapped in wrought iron and edged in green. Also of note is the attractive Corniche with its promenade, Bait al Zubair Museum and the bustling souks within Muttrah which are the perfect place for Omani specialities such as handcrafted silver, textiles and perfume. Beyond Muscat, Oman has lots to see and do. Just under three hours from the capital the rugged interior has adventures aplenty, including camel treks and four wheel drive safaris through mighty canyons and the towering dunes of Wahiba Sands which curl and roll to the horizon in every direction. 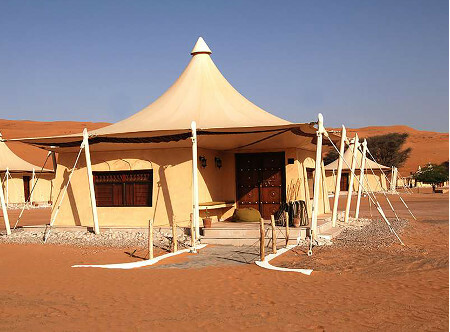 We highly recommend a night or two in the desert in a Bedouin style tent. 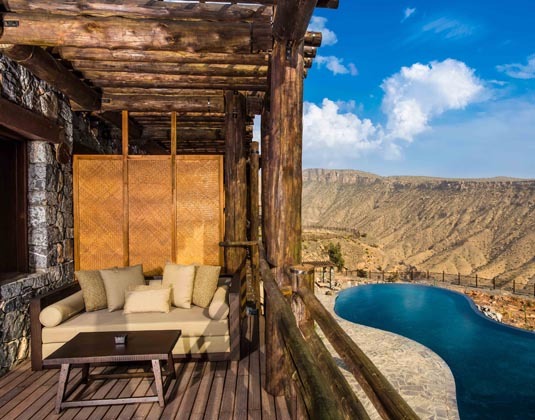 Consider also spending a few days at a stunning mountain retreat in Jabal Akhdar (which translates to Green Mountains) for truly awe-inspiring views of the surrounding peaks and valley area. Part of the Al Hajar Mountains, this is one of Oman’s most spectacular sights. The area will also fascinate history and culture enthusiasts, who can explore the many heritage sites such as Nizwa Fort, renowned for centuries as the ‘Pearl of Islam’, the ornately decorated Jabreen Castle and the impressive UNESCO listed Bahia Fort, which dates back over 800 years. Our vastly experienced travel advisors are passionate about Oman. With first-hand knowledge of when and where to go they can create the perfect holiday experience for you, at the best possible price. Flight duration: Muscat is approx 7 hours from the UK. Zighy Bay is 2 hours drive from Dubai. Salalah is about 1� hours flight from Muscat. Best time to travel: With virtually guaranteed year-round sunshine, Oman is perfect year round. Summers can be blisteringly hot, with temperatures often in the 40s�C however, this does bring lower prices and therefore it�s great value during our school summer holidays. Winter months see pleasant Mediterranean like temperatures, making Oman a fantastic place to escape the cooler temperatures of the UK. Recommended airlines flying non-stop to Muscat: Oman Air. Additional airlines also fly indirectly from the UK to Muscat: Air France (via Paris), British Airways (via Abu Dhabi), Emirates (via Dubai), Etihad Airways (via Abu Dhabi), KLM (via Amsterdam), Qatar Airways (via Doha). Passports & Visas: A visa is required for entry into Oman. For arrivals by air, British passport holders may purchase a tourist visa for up to 10 days for OMR5 or for 30 days at a cost of OMR20 per person in cash. If you arrive into Oman by road from Dubai, visa formalities will be completed in preparation for your arrival and no visa charges will be made locally. You also now have the option to pre-pay for your visa, which may save you some time on arrival, as there will be a separate lane for visitors who have arranged an e-visa. Go to: evisa.rop.gov.om/voa and select "unsponsored visa" to make an application. Visas are normally approved within 24 hours. In due course, the visa on arrival option will be removed and all visas will need to be obtained online. Ramadan: During Ramadan (approximately 15 May-14 Jun 18), it is forbidden to eat, drink or smoke in public places (including hotels and those offering all inclusive) between sunrise and sunset; and no live entertainment is permitted. Hotels usually provide a private area where non-Muslims can eat during the day. Alcoholic drinks are not served in hotels (including those offering all inclusive) on dry days and other days stipulated by the government. Alcohol is available in Dubai hotels after sunset. Please ask for more details at time of booking.